A festival, by definition, is not a brick and mortar performance room, and so it’s not necessarily a ‘venue.’ Instead, it’s a term applied to those typically days-long events that feature dozens of acts, and multiple stages. What also sets ‘the festival’ setting apart from most other live music situations, is that they’re held outdoors in a park or on a farm, like Tennesee’s Bonnaroo, Chicago’s Lollapalooza, and California’s Coachella. Festivals can have a close to tie to a specific musical genre, like Merlefest or Philly’s FolkFest, Hersheypark stadium’s recent MixTape Festival or their upcoming Rock Allegiance. But they also can run the gamut of styles in an effort to appeal to a larger audience, such as this weekend’s Jay-Z and Pearl Jam headlined Made in America festival that takes place in Philadelphia, or the 10 day long New Orleans Jazz & Heritage Festival which has a certifiably eclectic assortment of bands. Though the oldest annual music festival in the world is still a disputed fact, it’s surmised to be between the Netherlands own Pinkpop Festival and the smaller, more community-focused, Oregon County Fair, which gets about 45,000 guests every year. Conversely, Milwaukee’s Summerfest is known for holding the record for biggest festival attendance. Over its eleven-day span, it brings in nearly 1,000,000 fans. Historically though, the festivals that are on everybody’s minds are those from the late 1960s which were filled with legendary acts and stories: the tragic Altamont and the inspiring Woodstock. 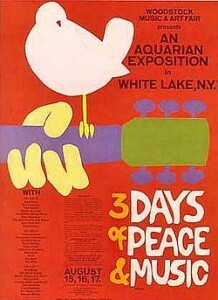 Held on a farm in upstate New York, Woodstock Music & Art Fair was billed as “3 Days of Peace & Music” and took place in mid-August 1969. It featured 32 bands, and had 500,000 concert-goers in attendance. Some of the legendary groups to perform were Santana, Creedence Clearwater Revival, Grateful Dead, The Who, Jefferson Airplane, CSNY, Joe Cocker and the Fish, and Jimi Hendrix. A grueling weekend of rain and mud did not stop those in attendance from enjoying themselves, and making history. Probably more famous for having the Hells Angels as the security detail and unfortunate disaster that ensued, the show was put together and headlined by the Rolling Stones. Altamont Speedway Free Festival was held on December 6, 1969 and had around 300,000 people in attendance. The show featured Santana, CSNY, The Jefferson Airplane, and the Rolling Stones. Locally, there is a springtime festival that’s rooted in Lancaster, called Launch Music Conference & Festival, and nearby this weekend is Harrisburg’s annual Kipona along Front Street. There are tons more of these festivals in and around Central PA – check out the Jambase guide for all you need to know.